January 28, 2019 4:12 pm. Sent straight to the front by Fabrice Veron, the 4-year-old filly, the youngest runner in the race and receiving weight from all her eight rivals, was harried throughout by ES Ajeeb, the pair stalked by Wadeeaa, winner of the Group 1 Al Maktoum Challenge R1 on her previous start.They swung slightly wide off the bend, taking ES Ajeeb with them and allowing Wadeeaa to draw virtually level on the inside, but once in the straight, the Eric Lemartinel trainee ran on strongly to deny Wadeeaa who was closing fast in the final100m. However, Veron’s mount, owned by Sheikha Alyazia bint Sultan Al Nahyan, clung on grimly to add to her debut victory in a 1400m maiden on the Al Ain dirt and 1600m success in the Listed Abu Dhabi Championship six weeks ago. The main support race, the Abu Dhabi Equestrian Club Gold Cup, a 1600m contest carrying Prestige status, was won in determined fashion by the gallant 9-year-old, AF Al Hazer, a third winner on the card, after four races, for the always feared Khalid Khalifa Al Nabooda, Ernst Oertel and Tadhg O’Shea combination. Settled behind the early leader, Shaheer, they took up the running when that rival weakened 300m out and always looked likely to score and register a fifth victory for the horse on just his second outing of the campaign having failed to land a blow in the Group 1 Al Maktoum Challenge R1 a fortnight ago, his first start since finishing third in this race last year. It was actually his first win since early January 2014 when, over the same 1600m, he landed the Listed Arabian Triple Crown R1, but he has run some fine races in defeat, including when third in the 2017 Group 1 Al Maktoum Challenge R3 on the dirt, a surface he has not won on, at Meydan. 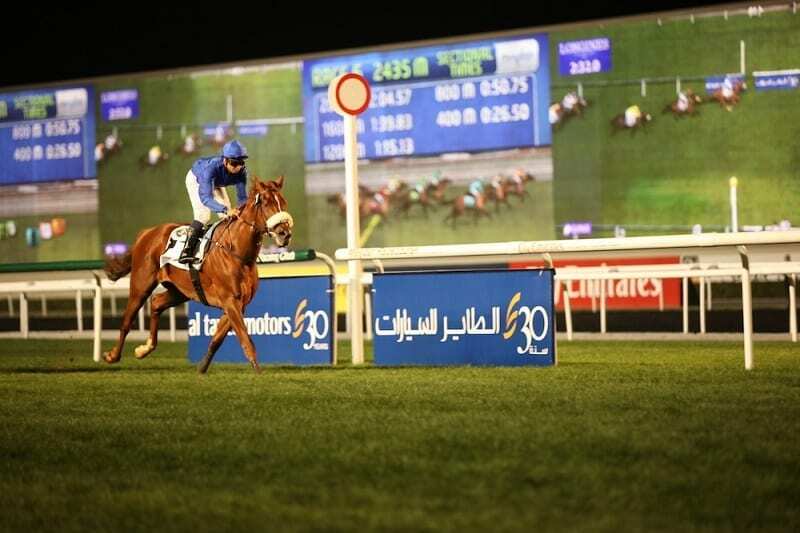 The action kicked off with a 1600m maiden restricted to horses foaled in the UAE and AF Al Aassi was able to make it third time lucky for the same trio. Settled in third, just behind the leaders, the 4-year-colt, homebred by Al Nabooda, was sent for home 350m out and was always holding the late challenge of Blue Diamond. Connections immediately doubled up, combining to take the following 2200m maiden with Daana who, from 14 previous starts, had twice finished both second and third, but made no mistake on this occasion. Settled nearer last than first by O’Shea, the 6-year-old mare could be spotted making stealthy progress down the back straight before encountering traffic on the home turn, forcing the champion jockey to pull her wide. Once in the clear they swept to the front nearing the 200m pole, staying on strongly to deny Laheeb Al Reef who was finishing fast and late under Gerald Avranche, but the line appeared just in time for Daana. Dassan Da registered an emphatic victory in the 1600m handicap restricted to horses in private ownership, taking up the running 450m out before powering clear under Emirati apprentice Saeed Al Mazrooei. Trained by Helal Al Alawi for Khalid Mohd Rahma Al Shamsi, it was a third career victory for the 7-year-old and second in the UAE having won a virtually identical handicap last February, as well as a 2100m victory on an all-weather surface in Europe back in June 2016.